Thanks a ton for the picture comments man! 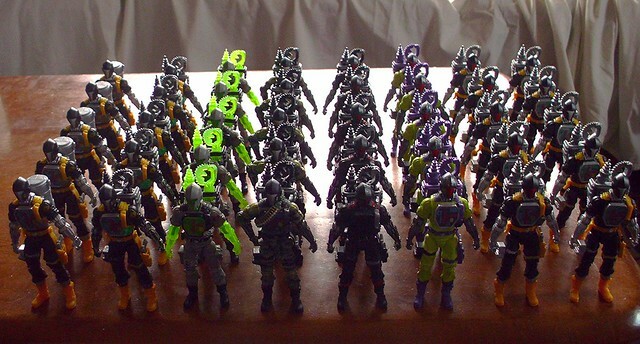 Oh, those are the ones that came with the Defense of Cobra Island Battle Pack. Apparently the canisters are pulled either from a comic or ARAH episode where the BATs dropped spores out of them that turned into vines to grab the Joes. Thanks a lot man I pulled him out and was like, "hmm, I don't remember asking for this guy but I guess I must have". I definitely needed him, so thanks a lot for your generosity! I think he ends up completing my Ninja Force collection. If not, at least its one step closer Haha! Thanks. Obviously the rest of my Joe Collection is very small because of all the BATs, but I have pretty much everything I wanted the most. Shame they're done with those Joe/TF sets. They were pretty cool. Last two BATs have been SDCC and FSS, hoping the next BAT I have to army build isn't so hard to get a hold of. Oh, here's the full army taking over the coffee table.